Second version of the ship. The Eshu is somewhat vulnerable to being flanked, however, and relies on a destroyer screen to intercept more distant threats, and its own formidable drone capacity combined with supplementary HED lance batteries for close-in point defense to defend itself. Still, its casualty projections are far higher than the Oya Class, a fact that makes this class a popular posting for those craving frontline combat experience. 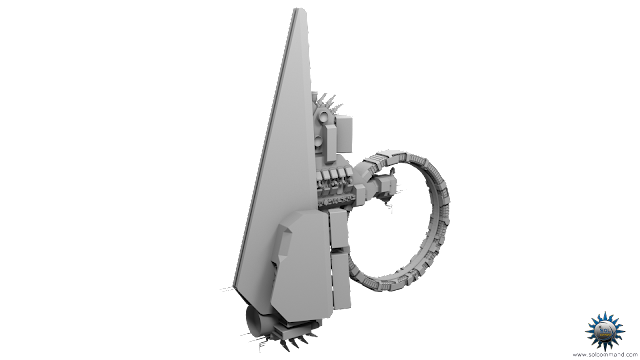 Notably, the Eshu's single habitat ring armature is, unlike those of the Oya, fixed in place to take maximum advantage of the heavy forward bulkhead. The inner ring's rotation inside the armature is stopped during combat engagements thus the entire ship crew experiences zero-g environment and they're required to use special harnesses to prevent them from being injured during combat maneuvers. This free 3D model has a triangle count of 81.289. Download it via the provided servers.